That a village with such a hauntingly beautiful name can be so bleak is an irony that will not escape you if you ever visit it. Set along the ratrun of the hellish Beccles to Bungay road, you might as well be living in town - except that here there are no shops, and no pub. There isn't even a church; St Bartholomew was declared redundant in 1980, and sold off for housing. Curiously, Shipmeadow is one of only two parishes in Suffolk with two redundant churches (the other is Braiseworth), for on the hill above St Bartholomew, beside the brooding hulk of the institution it was built for, is the former workhouse chapel of St James. Workhouses were the creation of the poor law unions. Individual parishes had a responsibility for the welfare, in extremis, of those born within their boundaries. Increasingly though, their resources to do this were stretched, and so parishes united to provide institutional care for the destitute and the homeless, as well as those too physically or morally deficient to work. Sometimes, they took over an already existing institution to do this. And that's what happened here. Shipmeadow Workhouse was built in 1767 "for the better Relief and Employment of the Poor in the Hundred of Wangford, Suffolk" and became the Workhouse of the Wangford Poor Law Union on 25th June, 1835. Set on this exposed hilltop site, miles from the nearest town, it must have been a bit like being sent to Siberia. Let us imagine that you are alive in the second quarter of the 19th century, and you have fallen on hard times. Maybe you find yourself unemployed, perhaps during one of East Anglia's regular agricultural depressions. Eventually, you would be unable to pay for the squalid room you rent from the farmer. Your family are hungry. There is no Social Security system, so at this point you might well undertake the long journey, on foot, sleeping under hedges, scrabbling roots from a field for a meal, back to the Parish of your birth - a place that modern sentiment would call home, but this word means nothing. There, you throw yourself on the mercy of the parish, on the mercy of the workhouse. The Parish system was based on the structures of the established Church of England, the state church. Were there Christian principles behind the workhouse? In 1832, we find the Reverend Millman writing to Ernest Chadwick: The Workhouse should be a place of hardship, of coarse fare, of degradation and humility; it should be administered with strictness, with severity; it should be as repulsive as is consistent with humanity. Workhouses were not prisons. It was possible for an inmate to leave. But to what purpose? Our pregnant 14 year old would not easily control her own destiny. Workhouses are symptomatic of the institutionalisation that the Industrial Revolution brought to the English, a mindset that has only begun to fade in the last 20 years or so. Standing outside pretty St Bartholomew, I gazed up at the tenements bristling on the hill top. At the east end of the range stands a taller building, with a little spirelet. I cycled on, and then up the access road that leads to Wangford Union House of Industry. The road is a modern one, and doesn't follow the route of the original, but it is still possible to imagine the sorry tread of the destitute, the dull clatter of the ambulance cart, the sobbing of the children, as they beat a hideous path to this place. The Workhouse closed after the First World War, and was in use as an old peoples' hospital after this. later, it was reduced to being used as farm buildings, but was rescued in the 1980s, and converted into houses. The same fate befell the chapel, which had become derelict, but is now 'St James House', and consequently you can't go inside. This is a pity, because the chapel was the work of one of the major architects of the 19th century. His name was George Edmund Street, and his work elsewhere includes the Royal Courts of Justice in The Strand, London, as well as St James the Less in Vauxhall Bridge Road. I'm not sure why he was chosen for this commission, but it probably had something to do with the fact that the Patrons of the adjacent Barsham and Shipmeadow parishes were the Sucklings, major players in the Anglo-catholic world of the late 19th century. They also held the patronage of several major Anglo-catholic shrines in the east end of London. At the time of the 1851 Census of Religious Observance, the church of St Bartholomew could count on an afternoon attendance of 120, mostly made up of inmates of the workhouse. As Marion Hall observed to me, the Victorians must have been in quite a bind - wanting to thrust religion on the great unwashed, but not liking the stink. In 1866, then, the Sucklings commissioned Street's elegant chapel, and thereafter the twain need not meet. The Reverend Suckling remained the Workhouse chaplain, and could administer the moral control of the State Church. Non-conformist and Catholic inmates were allowed visits from their own clergy, but only under specific circumstances. One gets the impression that the poor were expected to be grateful to the parish, and that this would be reflected in religious practice. The red-brick chapel looks not unlike Blomfield's contemporary church of St Peter, Culford Heath, the spirelet forming a bell tower. There are curious dormers, and elegant little double lancet windows, very urban, and which must make the interior very dark. Few workhouse chapels survive. That at nearby Oulton is now an ambulance station. 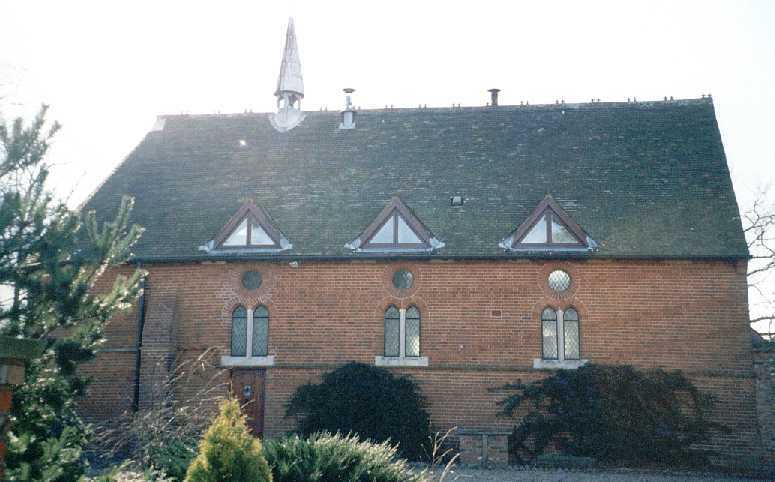 Across Suffolk, Exning workhouse chapel has during the last few decades been converted into an Anglican church. Mostly, Urban workhouses became hospitals, while rural ones were often left to fall. Fear of the workhouse was real, and hatred of them ever-present, and even reached down to people like me, born in the 1960s. These buildings contain a memory of the past still painful to those who can sense the ordinary ghosts who might have been us. Shipmeadow Workhouse Chapel of St James is set on a hill to the south of the main Beccles to Bungay road, about three miles west of Beccles. It is a private house, and is not open to the public. 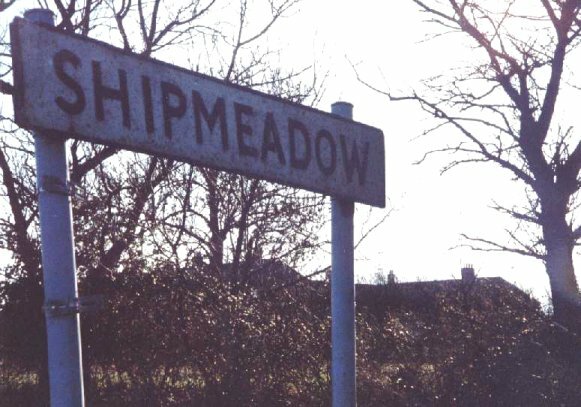 Check out several excellent sites: Oxford University's workhouse archive entry for Shipmeadow, which includes lots of plans, The Workhouse site, and Ken Barlow's Shipmeadow pages, with more photographs. My thanks to Patricia Bridges and Marion Hall for their help with this entry.